The size of Michael Moore’s latest book, “Here Comes Trouble : Stories from My Life, ” may discourage readers, but the book is composed of several engaging stories about different periods of his life and people who have influenced him. The book’s introduction, “Epilogue: The Execution of Michael Moore,” sets the stage for the other stories in this book, wherein Moore describes the fallout from his questioning the justification for the Invasion of Iraq on the night of March 23, 2003, after winning the Oscar for Best Documentary for his film, “Bowling for Columbine.” He notes, with no little sense of humor, that he was offered champagne, a breath mint, and an insult from a stagehand, in that order. 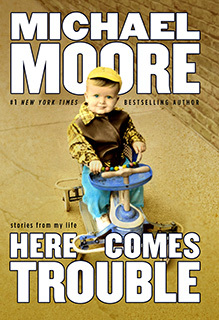 I found myself chuckling often when reading this book – Moore learned to crawl backwards before he decided to move forwards, he learned to read actual words before learning the ABCs, his mother refused to let him skip a grade in elementary school despite his advanced reading skills – which led to him becoming the class troublemaker. Moore also writes about social events and tragedies such as the story of the persecution of a Gay young man in his neighborhood in the mid 1960s, or the story of an African-American teacher who prepared her students for a social outing and taught her students proper restaurant etiquette and then disappeared after the death of her soldier husband in Vietnam during the Tet Offensive. I would recommend this book to anyone who has seen Michael Moore’s films and even to those who may not particularly like him, since this book is often amusing reading and reveals the motivations behind this controversial filmmaker and author. In this time of holiday joy and happiness, there are many people in Alameda County that cannot afford well balanced meals for themselves and their families. Due to the economic downturn, many never imagined they would be struggling to put food on their tables. Many are desperate and calling for our help to put food in empty cupboards across Alameda County. The employees of Alameda County Library would like to invite the public to join us in our fight against hunger by donating to the Alameda County Community Food Bank. By going to 2011 Alameda County Holiday Food Drive , you will be directed to food barrels located through out the county. Your donations will help provide low-income families and individuals with emergency food assistance and the most invaluable resource of all, hope. The Dublin Library has teamed up with the Alameda County Community Food Bank to have two donation barrels on our lobby. 95 percent of teens between the ages of 12-17 are now online—and one in five of them say they’ve been bullied in the last year, either in person, online, by text, or by phone, says a new study by the Pew Research Center’s Internet & American Life Project. Many children who are victims of cyberbullying do not inform their parents that this is going on. What can a parent do? Val Ridad, Community Safety Assistant for the Dublin Police Services, will present “Internet Safety – A Presentation for Parents,” a program on protecting your children from Internet predators, cyberbullying, sexting and digital reputation problems on Saturday, November 19th, from 1:00 to 3:00 p.m. in the Dublin Library Program Room. This free program will be held in the Dublin Library Program Room. There will be time for a question-and-answer session at the end of the program. The Discover Genealogy program finished up over this last weekend. This program was part of our library’s participation in the Tri Valley Heritage Happening for October 2011. 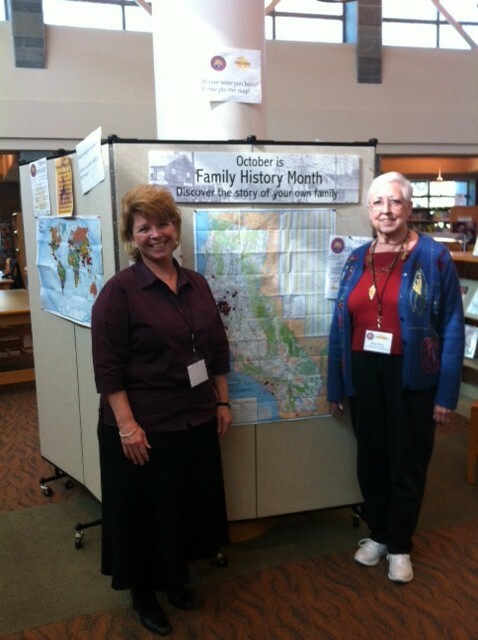 The Dublin Library wishes to thank all the wonderful volunteers from the Livermore Amador Genealogical Society (L-AGS) for making this program a success! cannot afford any longer to stay in their home (Transition Assistance Program).